It’s that time of year when Spoon Graphics gets a little older, with 2016 marking 9 years of tutorial creating, freebie sharing and article writing on what started as a blog that was attached to my portfolio website in 2007. Every April I take some time to reflect over the past 12 months and talk about how things have changed. Last year I talked about some new additions to my site, such as the email newsletter and my video tutorials YouTube channel. Those areas have grown massively since then, so let’s take a look at what’s new. The biggest change to Spoon Graphics this year was the whole new look that I released in November 2015. I have a dedicated post that documents the changes, but it has definitely proved to be effective when looking at the newsletter sign up stats. Previously I saw around 3-4k new subscribers per month, but that spiked to 7k immediately after the new design went live. 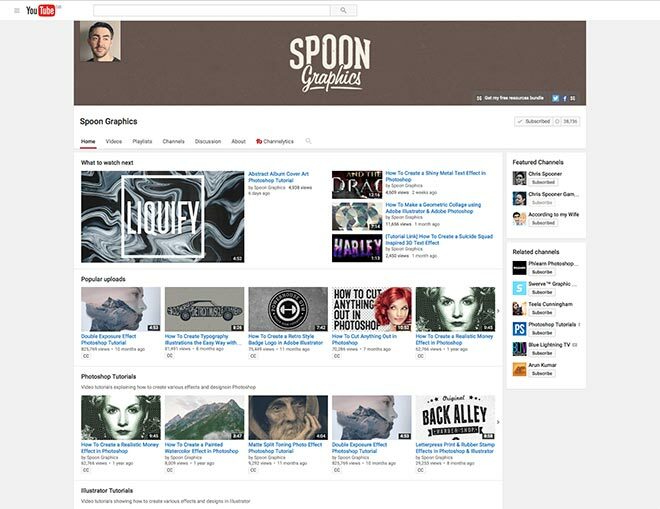 My Spoon Graphics YouTube Channel has also grown dramatically over the past year. In the last anniversary post my channel had just 5 videos and 1,200 subscribers. It’s now fast approaching 40,000 subscribers, almost 1.5 million views across 30 videos, with the most popular upload reaching 825,412 views thanks to a great search results position under the keyword ‘Photoshop tutorials’. 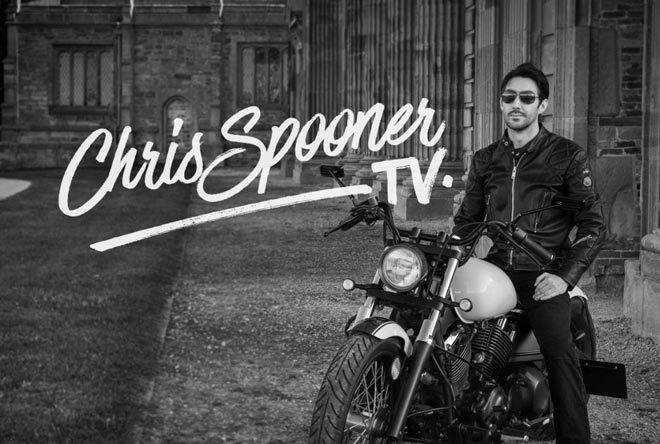 Many of these videos have gone on to attract a much larger audience beyond the subscribers of my main Spoon Graphics website, so it has been a great tool to help spread the word about my content. A couple of years ago I was a little worried when my traffic dropped for the first time, but it picked up again the year after so this year’s drop of 12% doesn’t bother me too much. It also becomes less apparent depending on how large the sample is, with it showing just a 1% drop if I factor in the full year. My most visited piece of content is still the roundup of t-shirt mockup templates, although second place has changed from a roundup of print design mockups to a roundup of poster design mockups. 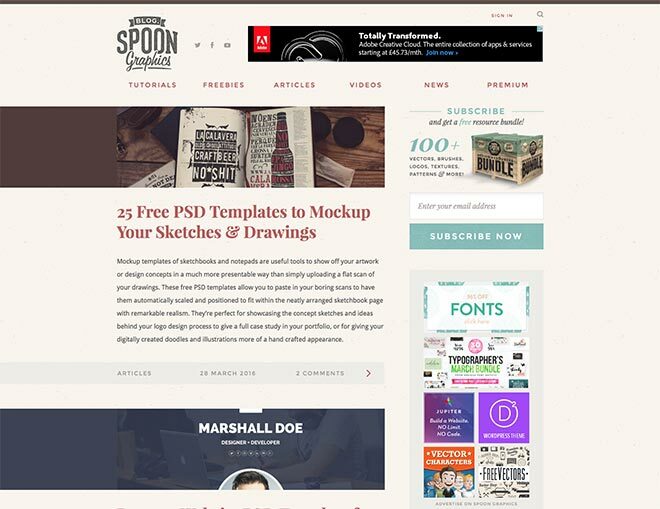 Either way, it further proves how popular those PSD mockup template roundup posts have been. Let’s see if my most recent from last week, 25 Free PSD Templates to Mockup Your Sketches & Drawings will make it into a future top spot. As I previously mentioned, my mailing list has continued to grow nicely, especially after my recent design tweaks that highlight the subscription forms more prominently. 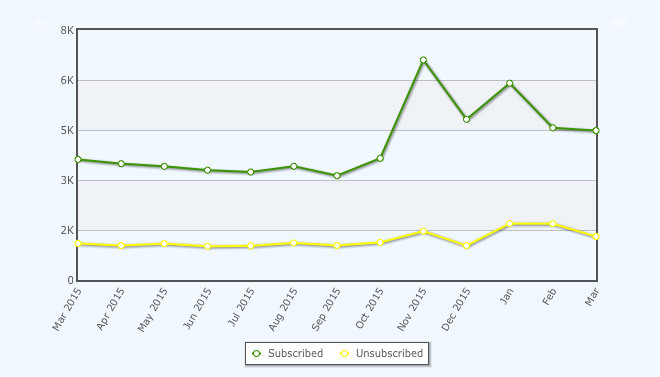 I cited 130 daily new subscribers last year, that figure now averages at around 200. There has been no change in my server setup lately. Everything has been running fine, with just an increase to almost 8TB per month bandwidth as more freebies and bundles have been downloaded. The email newsletter service is now by far my largest expense, costing over $700 per month, on top of hosting bills of around $400-500. Thankfully ad revenue has been consistent, Access All Areas memberships have continued to increase and my readers have been snapping up the great design deals I’ve spread the word about in my newsletters, which all help me continue to share my tutorials and resources for free. Thank you for all your support! I always like to round off these birthday/anniversary posts with an update from my personal life, whether it’s getting married in 2013 or the arrival of our baby girl in 2014. At the time of writing this post we’ve just had an offer accepted on a new family home, although it’s probably too early to share in detail. If you are interested in finding out more, I now have a personal channel on YouTube where I share vlogs and videos about the stuff I get up to when I’m not sat at my computer. 9 years – just one away from a decade! Now that’s a feat! The consistent videos have been my favorite addition to the site this year. It’s awesome to see how much the stats have grown because of it. Happy Birthday and congratulations! I am a fan of your site and regular visitor too. :), Keep the great posting, all the best! Happy Birthday! Thanks for sharing, I love me some stats! Wow! Congratulations man, this is incredible. Keep up the good work! Congratulations Chris! You have been of immense help in my learning curve. Thank you so much! Wishing you many more successful years. Good luck! Congrats Chris! Seems like only yesterday when you turned 1 and I was in my first year at design school. I still laugh at the fact I was learning more from your blog than my teachers, lol! I just discovered your website and I’m fangirling! I promptly jumped on your email list to snag all the goodies. Thanks for being so generous and congrats on your growth spurt. Congrats!! And thank you very everything. Huge congratulations mate! :) I always love seeing your annual round up, it’s so inspiring, and just goes to show how putting in the work and steadily progressing pays off in the long term. I’m so glad the new design’s doing well for you (I thought it would! ), and congrats again on the new home! Thank Tom! 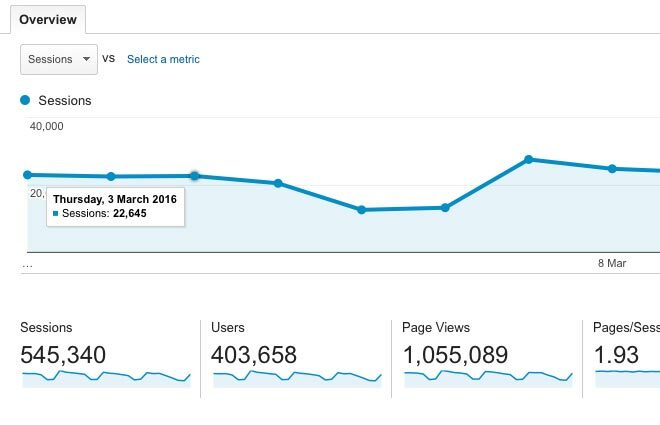 I appreciate all your help which has really boosted my site’s performance over the past couple of years. Congratulations! I always look forward to your tutorials. You are a legend and you deserve every minute of it! The online design world just would have not been the same without SpoonGraphics! I saw a video walk-through the other day and it looked like your resources being used. CONGRATULATIONS! Thank You Su! I really appreciate all your comments across all my posts. I’d love to check out that walkthrough if you can remember where you saw it. Another great year Chris, you need to throw a bash for 10 years! As an early follower for years now I’ve always enjoyed your content especially tutorials and a few of your freebies have helped me out big time once or twice. Looking forward to what the next year holds and good luck with the house move. That sounds like a nice idea! It would be great to meet up again with a bunch of the people I’ve met IRL at design conferences. It’s fab to hear my resources have helped out, thanks for putting them to good use! Hi Chris! 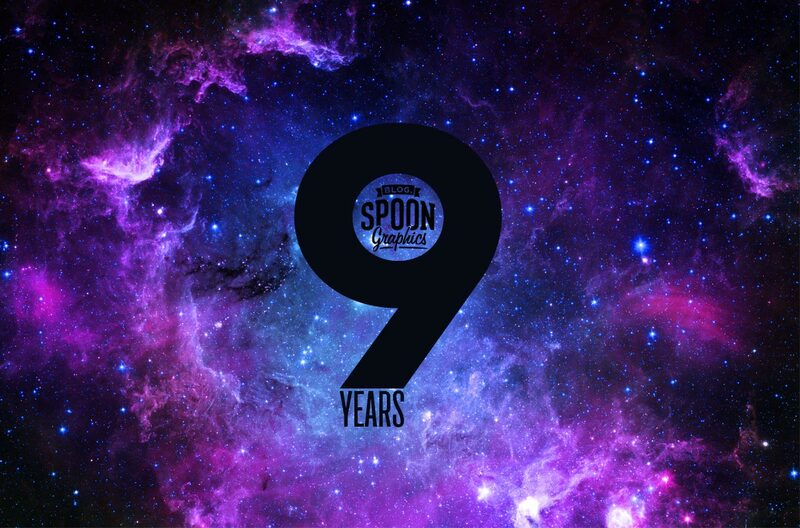 Congrats for your SpoonGraphics. Since when I discovered your blog (2 years ago) I star following your tutorials and videotuts too improving my skills. I just write to say Tank you so much for your freebies, tuts and the precious advice. In your blog any detail is elegant and -most important too- you still inspiring a lot of graphics designer. Very well done. Well done, great feat and fabulous site. I also love that you acknowledge your personal life and the impact and connection of family. Thank you. Congratulations on both the personal and professional level, Chris. Your insights/offerings provide real value and always cut through the noise that permeates my daily travels on the Web. Congrats! Always curated content and fresh stuff for those in the industry! Keep the flame alive! Congrats Chris on celebrating the 9th year! I’ve followed your work for a good few years now, and it’s always such high quality and usefulness. Thanks for all the time and effort you’ve put in. All the best for the next year – the BIG 10 yr celebration!! Congrats and Happy Birthday to your blog, Chris! Although I’m not a “loyal” visitor to your site, I have to admit that throughout the years I’ve always found help on your blog for one or more of my issues and I guess the whole design community stumbled upon your tutorials at one point, so great job for that and keep going! Your passion and hard work is reason behind the success of SpoonGraphics. Anniversary is always a milestone to celebrate the achievements and the opportunity to set new goals. Congratulations on your success Chris! Congrats Chris! Big fan of your video tutorials. I share them with my coworkers often. Thanks for taking the time to put them together! I came a little late to this blog post mate, haha but congrats again!!! another amazing year hey!